Bone broth is made from bones and the cooking process extracts more nutritional value from the bones to benefit your diet. Usually beef or chicken bones that are first roasted and then simmered for 24 hours or more. A little vinegar is sometimes added to the broth to help extract minerals. Spices and herbs such as cumin, black pepper and cinnamon can also be incorporated to improve taste. By the time the broth is cooked, the bones should be so soft that they crumble once pressed gently. Once cooked, it should be strained to get rid of all solid particles. It can be stored in the freezer and consumed over the next couple of weeks following your surgery. While quite pricey, commercial broths can also be found in the refrigerated section of health food stores. Don’t be mistaken, this is not your typical boxed broth as it should be specifically labeled as “bone broth”. Flavors can get pretty creative i.e. “Chicken Curry” or “Cranberry Turkey” and add variety and nutrition to a clear liquid diet. After Bariatric surgery, individuals are usually subjected to a liquid diet because their digestive system cannot handle solid foods. The liquid diet is supposed to supply them with adequate amounts of electrolytes, nutrients, and energy that supports healing following surgery. Bone broth comes highly recommended because it is packed with nutrients that help promote healing, it’s easy to digest and to fill. When it comes to how nutrient rich your bone broth is, it all begins with the source. Commercially prepared broths that can be bought from the store are not as nutritious. Homemade broths, on the other hand, are filled with valuable nutrients that can help you recover faster and easier following your bariatric surgery. Protein- After surgery, your body needs repair to help heal the scar tissue. Protein is the body’s building block and essential for healing. Calcium- Calcium is key for healthy bones and teeth. After bariatric surgery, you are expected to lose a significant amount of body weight, but you want your bones to stay healthy so that you’re strong and fit even after weight loss. Bone broth contains glycine which helps in the stimulation of stomach acid. Acid reflux is not uncommon after bariatric surgery, and while many people think it is caused by too much acid, studies have shown that too little stomach acid could be the real cause of reflux. Glycine also promotes secretion of bile acid, which is vital in the digestion of fat in the small intestine as well help in maintaining blood cholesterol levels that are healthy. This is key after bariatric surgery because you need to lose weight and regain optimal health from the inside out. Bone broth is vital for detoxification. The body has its own natural mechanism for getting rid of toxins from the body and that is the function of the liver. The glycine found in the bone broth simply gives your liver a hand in eliminating any dangerous toxins from the body. These could be from some of the medications that you have to take following surgery, toxins from liquids or solids consumed before or even after the surgery. Bone broth has anti inflammatory properties from the rich proteins it contains. It, therefore, helps in quick recovery following surgery. The stress surgery causes on the body demands an increase in amino acids. Although your body synthesizes some essential amino acids, to boost the levels some must be obtained from the foods we eat. Bone broth has conditionally essential amino acids that help in promoting a quick recovery following bariatric surgery. Bone broth comes highly recommended by many patients who have undergone bariatric surgery. 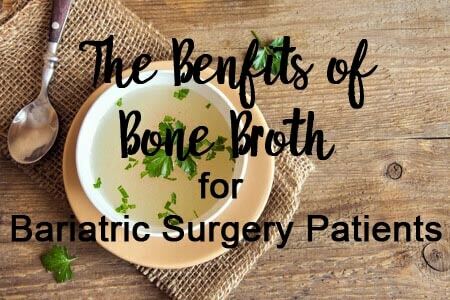 It is agreed that homemade bone broth is the best because it does not contain preservatives that could upset the delicate stomach following surgery and it has a higher nutrition value. No study has been able to show that bone broth is the best food supplement after bariatric surgery. However as discussed above, it is rich in nutrients and minerals that can promote recovery and while helping you toward the weight loss journey. The fact that it is not a light liquid like herbal teas and other liquids that provide similar nutrients means that it can help you feel fuller. After surgery, your food intake must be reduced, but this is not to say you will not get hungry. Bone broth will help you feel fuller for longer thus managing your food intake. Although added herbs and spices will make your broth more palatable, caution should be taken to avoid spices and herbs that could upset the stomach by causing gas build up or acid reflux.